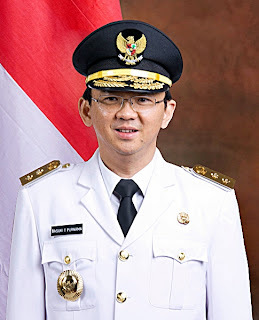 Basuki Tjahaja Purnama (EYD: Basuki Cahaya Purnama, Chinese: 鍾萬勰; pinyin: Zhōng Wànxié; born June 29, 1966) is the Lieutenant Governor of Jakarta and a former lawmaker in the Indonesian House of Representatives. He is also known by his Hakka affectionate nickname, Ahok. Born in Manggar, East Belitung, he previously served as East Belitung Regent from 2005 until 2010. Recently he became the running mate of Joko Widodo, commonly known as Jokowi, in the 2012 Jakarta gubernatorial election. They won the election with 53.82% of the vote. The ticket was nominated by the Indonesian Democratic Party – Struggle (PDI-P) and the Great Indonesia Movement Party (Gerindra). A member of a minority ethnic, Basuki has frequently become the subject of racist statements. During the 2012 gubernatorial race, he was targeted regularly by ultra-conservatives and supporters of the opposing candidates for being a non-Muslim. The most recent one was a tweet from an Indonesian "lawyer" and perennial presidential candidate which used a very clear racial reference. The tweet drew condemnation from many.